WhatsApp mistakenly rolled out the ‘Reply Privately’ feature in a beta update for Windows Phone that will allow users to privately send a message to a participant in a group without anyone else knowing about it. The hotly-anticipated feature is under development and could be rolled out with other features as well. The Private Reply feature appeared and was subsequently dropped from the beta version of the app, watcher of the popular chat app WABetaInfo said, confirming that the developers wrongly enabled the feature. 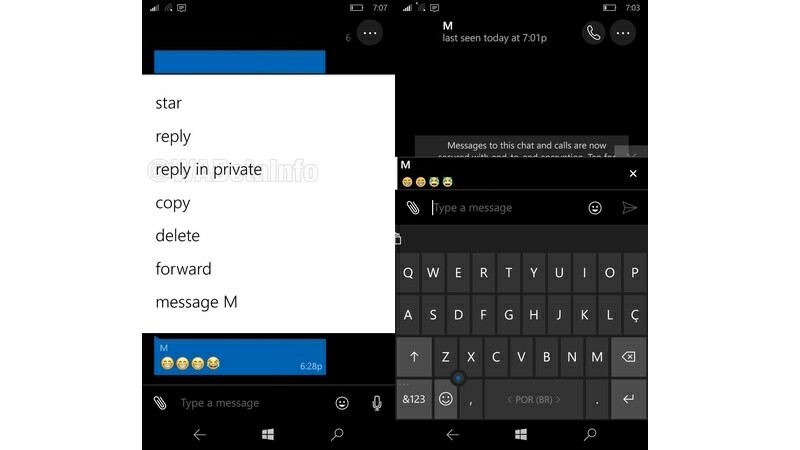 “In the new WhatsApp beta for Windows Phone 2.17.344 the private reply feature is disabled. Probably WhatsApp has wrongly enabled it in 2.17.342,” WABetaInfo tweeted. The feature was again implemented in the v2.17.348 beta update. WABetaInfo said that the Private Reply option will only be available in group chats and will be included in the small menu that pops-up when users press and hold on a message. They can then quote the message in a Private Reply to users, sent as a personal chat. In the early form it was spotted, there were still several bugs, WABetaInfo noted, such as being visible in personal chats rather than just group chats. Other new features that arrived with the v2.17.336 and v2.17.342 betas for Windows Phone include a new UI design for calls, similar to the Android interface, one that’s disabled by default. Also new is the Quick Switch to video call, enabling users to switch from a voice call to a video call without interrupting the conversation. Advanced group settings were also seen. Earlier this month, WABetaInfo leaked the details of the features that WhatsApp was developing for Web and desktop, including tap to unblock and a picture-in-picture (PIP) mode.